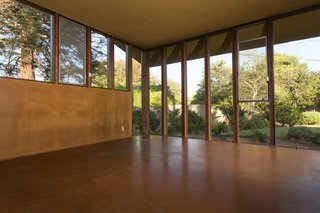 Built in 1951, the Alexander House is a beautifully preserved time capsule that exemplifies Californian midcentury architecture. Arguably one of the most important American architects of the 20th century, John Lautner left an indelible mark on Southern California residential architecture. 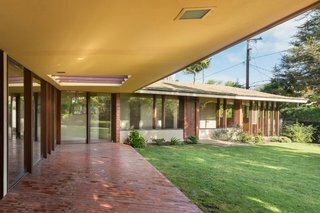 Best remembered for his contributions to the development of the Googie style and Atomic Age houses, Lautner gave us the Alexander House, which is hitting the market for the first time ever. It's currently listed for $1,650,000 through Crosby Doe Associates. Drawings of the Alexander House at the Getty Research Library attest to a strong dialog between the client and architect—in fact, the residence served its original owners so well that the home has gone 66 years without alteration. 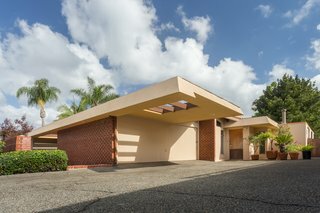 The elegant property is located in Park Estates, a planned community in Long Beach that features large lots, tree-lined streets, and an architectural review committee to oversee custom-built houses. The low-profile home graces its expansive site with a cantilevered overhang, visually connecting the home to the garden. Skylights and ample glazing help to blur the line between indoors and outdoors, and add to the residence's strong sense of California-style living. The 2,786-square-foot, four-bedroom, three-bath brick-clad home features a step-down living room, dining room, den, and workshop. 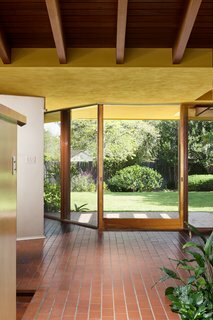 Floor-to-ceiling windows bring natural lighting to the interiors, while tongue-and-groove beamed ceilings, brick floors, paneled walls and built-ins impart a strong midcentury vibe. 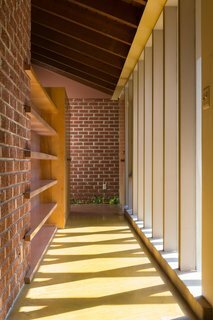 Interior privacy is maintained by the long horizontal brick wall screening the façade. The public spaces all open to an interior patio, and Lautner’s original drawings even designate a site for a swimming pool in the garden. The listing suggests that the Alexander House may be eligible for Mills Act tax benefits. 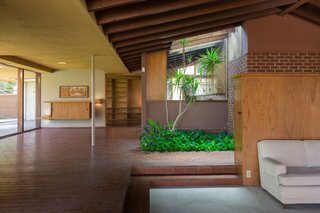 The Alexander House is being listed for $1,650,000 by Crosby Doe Associates.